Owners Aaron and Bethany Mallory at Farmhaus on Main in Waynesboro, Va. Friday Photo by norm Shafer. 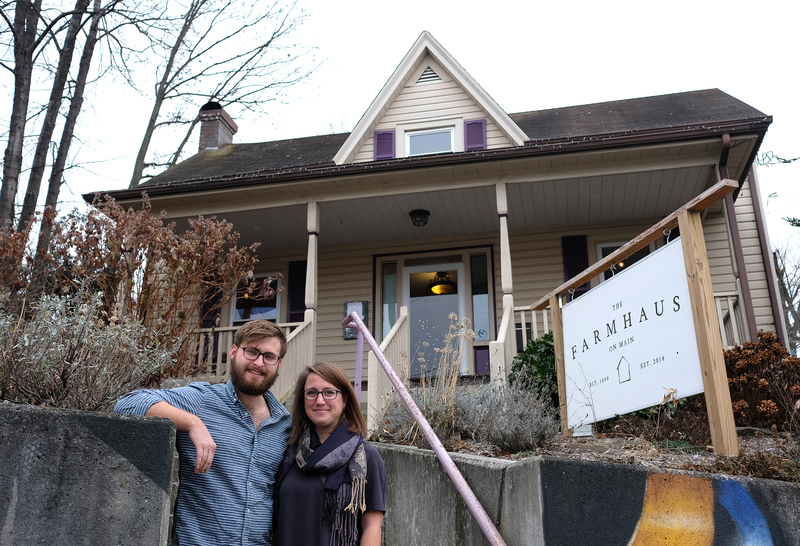 The Farmhaus on Main might be ringing in its one year anniversary this winter, but its roots and connections to Waynesboro run much deeper. 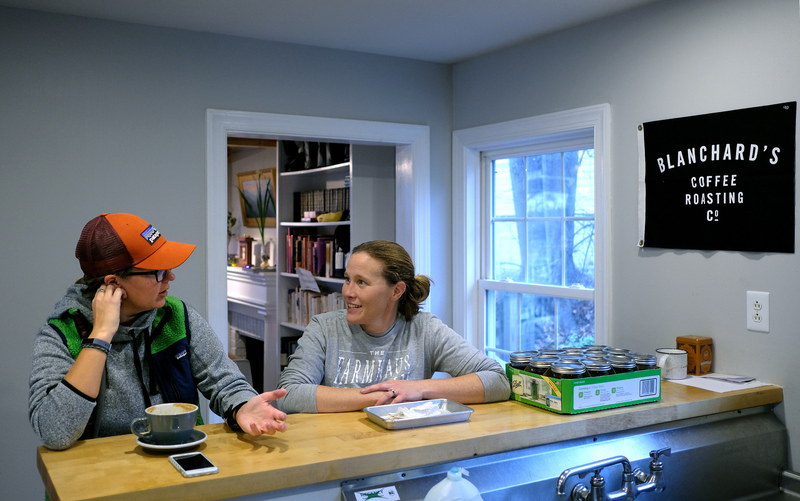 “We knew we wanted to be a coffee shop that functioned as a gathering place,” says Bethany Mallory, who co-owns the business with her husband Aaron. As Bethany and Aaron dreamed up plans to open their own business, they did so from their home in the Waynesboro Tree Streets mere blocks away from their business’s eventual home. 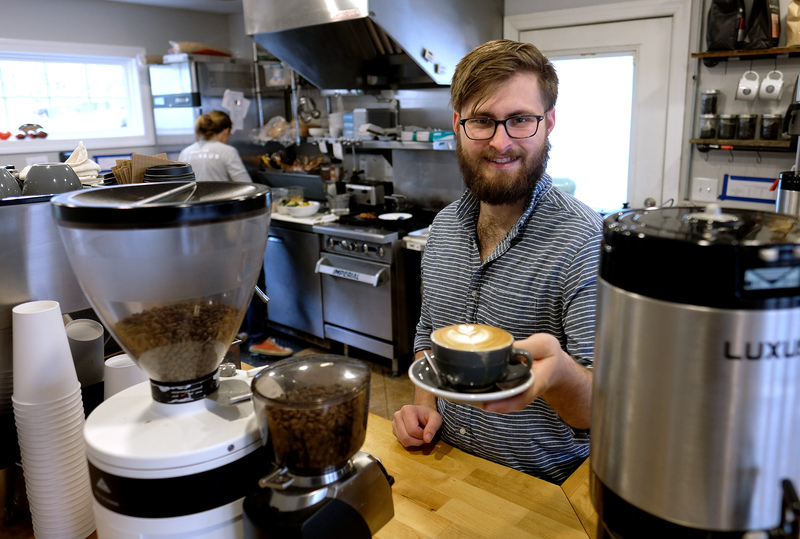 Aaron Mallory with a coffee creation at Farmhaus on Main in Waynesboro, Va. Photo by norm Shafer. If connection to community has been one cornerstone of the Farmhaus, discerning curation has been the other — of excellent coffee, of real food ingredients, of an interior space designed to feel welcoming and joyful. At every stage of their business development, the Mallorys have been focused and intentional. “We wanted to do everything we do extremely well, rather than bite off more than we can chew,” says Aaron. For the Farmhaus, that’s meant focusing on a single coffee roaster, Blanchard’s, who could help train new baristas, allow the shop to test new products, and get to know the Farmhaus’ location, staff, and ethos. It has also included focusing on signature menu items, seasonal dishes, and “products we can 100% stand behind.” From fresh local bread, fresh local honey, granola made by one of Farmhaus’ employees, to photo albums on the bookshelves of their coffee suppliers’ trip to Nicaraguan coffee farms, a sense of visible connection runs throughout the Farmhaus supply chains. Customer Taylor Sayer chats with Becky Elkins while she takes a break from work at Farmhaus on Main in Waynesboro, Va. Friday Dec. 15, 2017. (Photo by norm Shafer). Social Media is Part of Today’s World. One of the Farmhaus’ first outreach activities was a video interview with Bethany and Aaron talking about their hopes and vision for the store. The video went viral and was seen more than 20,000 times. “People were excited to see our faces,” says Bethany. “A younger demographic responded. Young folks came out of the woodwork.” Through outreach on Kickstarter and personal appeals, community members became invested in the ideas and success of the Farmhaus on Main. Customer Service is King. Repeat customers, supportive fans, and a community of customers who share growing relationships with the Farmhaus staff continue to drive the culture and feel of the store. As she chats, an employee scoops up a customer’s new baby, who coos with delight to see her. “This place is filled with memories and meaning,” says Bethany. The Farmhaus is such a convenient place to stop even if you are “just traveling through”!! It offers a nice respite from the usual fast food places along 64/81. The winter salad is delicious for lunch as are the soups. The atmosphere is so peaceful and friendly. Aaron and Bethany and their staff truly go out of their way to make people feel welcome. Great article about a wonderful couple and a great local business!!! This is one of my favorite places in Waynesboro. It is my go to stop for meeting friends and business associates.